Old map of the Azores Islands. The following article describes the history of the Azores. Stories of islands in the Atlantic Ocean, legendary and otherwise, had been reported since classical antiquity. Utopian tales of the Fortunate Islands (or Isles of the Blest) were sung by poets like Homer and Horace. Plato articulated the legend of Atlantis. Ancient writers like Plutarch, Strabo and, more explicitly, Pliny the Elder and Ptolemy, testified to the real existence of the Canary Islands. The Middle Ages saw the emergence of a new set of legends about islands deep in the Atlantic Ocean. These were sourced in various places, e.g. the Irish immrama, or missionary sailing voyages (such as the tales of Ui Corra and Saint Brendan) and the sagas of Norse adventurers (such as the Grœnlendinga saga and the saga of Erik the Red). The peoples of the Iberian peninsula, who were closest to the real Atlantic islands, and whose seafarers and fisherman may have seen and even visited them, articulated their own tales. Medieval Andalusian Arabs related stories of Atlantic island encounters in the legend of the 9th-century navigator Khashkhash of Cordoba (told by al-Masudi) and the 12th-century story of the eight Maghurin (Wanderers) of Lisbon (told by al-Idrisi). From these Greek, Irish, Norse, Arab and Iberian seafaring tales – often cross-fertilizing each other – emerged a myriad of mythical islands in the Atlantic Ocean – Atlantis, the Fortunate Islands, Saint Brendan's Island, Brasil Island, Antillia (or Sete Cidades, the island of the Seven Cities), Satanazes, the Ilhas Azuis (Blue Islands), the Terra dos Bacalhaus (Land of Codfish), and so on, which however uncertain, became so ubiquitous that they were considered fact. According to Bartolomé de las Casas, two dead bodies that looked like those of Amerindians were found on Flores. He said he found that fact in Christopher Columbus' notes, and it was one reason why Columbus presumed that India was on the other side of the ocean. In A History of the Azores, written by Thomas Ashe in 1813, the author talks of the discovery of the islands by Joshua Vander Berg of Bruges, who landed there during a storm on his way to Lisbon. This claim is generally discredited among academics today. As were local stories of a mysterious equestrian statue and coins with Carthaginian writing that were purportedly discovered on island of Corvo, or the strange inscriptions found along the coast of Quatro Ribeiras (on Terceira): all unsubstantiated stories that supported the claims of human visitation to the islands before the official record. But there was some basis in fact, since the Medici maps of 1351 contained seven islands off the Portuguese coast which were arranged in groups of three; there were the southern group, or the Goat Islands (Cabreras), the middle group, or the Wind or Dove Islands (De Ventura Sive de Columbis), and the western islands, or the Brazil Island (De Brazil). The Atlas Catalan (of 1375) also identifies three islands with the names of Corvo, Flores, and São Jorge, and it was thought that maybe the Genovese had discovered the Azores, and given them those names. But, generally, these stories highlighted that sightings were being made at the end of the 14th century, or at least, the peoples of Europe had a passing knowledge of islands in the Atlantic. Owing to the disorganized politics of the continent there were few nations able to organize an exploration of the Western Sea. There have been recent discoveries (2010–2011) of Hypogea (structures carved into embankments, that may have been used for burials) on the islands of Corvo, Santa Maria and Terceira, that might allude to a human presence on the islands before the Portuguese. There is no clear evidence that there were, in fact, other inhabitants on the islands, and archaeological investigations are only now commencing as to the age and relevance of these structures. The Azores archipelago began to appear on portolan charts during the 14th century, well before its official discovery date. The first map to depict the Azores was the Medici Atlas (1351). Its depiction was subsequently replicated in the Pizzigani brothers map of 1367, the Catalan Atlas (1375), the Pinelli–Walckenaer Atlas (1384), the Corbitis Atlas (c. 1385–1410), the charts of Guillem Soler (1380, 1385), Mecia de Viladestes (1413) and others. They are also listed in the Libro del Conoscimiento (c. 1380). It is notable that two of the names – San Zorzo and Corvis Marinis – would be transferred to the modern Azorean islands. Only Graciosa seems to be routinely missing on these maps. The Madeira archipelago also appears on most of these same maps, with their modern names: legname (Ligurian for "wood", Madeira), porto sancto (Porto Santo), desertas (Desertas) and salvazes (Savage Island). The source of this information is a mystery. It could simply be derived from pure legend, possibly of Andalusian Arab origin e.g. al-Idrisi speaks of an Atlantic island of wild goats (the Caprera?) and another of "cormorants", a scavenger bird (the "sea crows" of Corvis Marinis?) But outside their erroneous axial tilt, the Azores do seem clustered with reasonable accuracy. From this cartographic record, there seems little doubt that both Madeira and the Azores were discovered, or at least sighted, during the 14th century, well before their official discovery dates. One (unproven) hypothesis is that the Azores were discovered in the course of a mapping expedition in 1341 to the Canary Islands, sponsored by King Afonso IV of Portugal, and commanded by the Florentine Angiolino del Tegghia de Corbizzi and the Genoese Nicoloso da Recco. Although not quite described in the 1341 report, Madeira and the Azores might nonetheless have been seen from a distance on the expedition's return via a long sailing arc (volta do mar) from the Canary islands. Even if they were not discovered by the mapping expedition of 1341 itself, the islands may have been found by any of the numerous Majorcan expeditions that were launched into the Atlantic Ocean in the aftermath, destined for slaving runs on the newly mapped Canary islands. Regardless of who sighted them during the 14th century, there seems to have been no follow-ons until the 15th century. By the end of the 14th century, with the birth of the intellectual movements and the Renaissance, many maps began appearing with fictitious islands located in the Atlantic. At this time commercial contacts were expanding to the west linking the Mediterranean with coastal communities along the Atlantic, in particular, Genovese, Florentine and Venetian traders and many Christian groups building converts to the faith. This expansion placed the Kingdom of Portugal in a strategic place, where the seafaring Portuguese were eager to expand their realm and expand their influence socially, politically and in the eyes of the Christian hierarchy. In this context, Prince Infante D. Henrique (1394–1460) took on an important role in coordinating official Portuguese efforts with his financial support, the construction of new ships and the development of the naval schools to harness seafaring knowledge and promote new technologies and their use. Infante D. Henrique, or Henry the Navigator, is generally credited with motivating modern navigation and directing the discoveries during the age of exploration; for Azoreans he is one of their founding fathers. He studied the sea, weather, ships, geography and trade routes and talked to the navigators and captains. 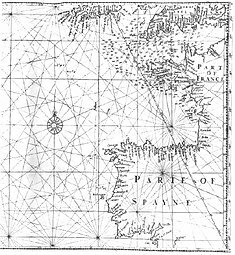 He brought to his navigation school, which he founded at Sagres in 1416, cosmographers, mathematicians, cartographers, and learned men of the known sciences, as well as collecting maps, charts, books, and other forms of knowledge. His motivations were not selfless: he was looking to the sea as a possible route to link up with the mythological Prester John, thereby encircling the Muslim world and driving them from northern Africa and the Holy Land. To accomplish this Infante D. Henrique derived funds from the trade in order to find a sea route to India. As leader of the religious-military organization, the Holy Order of Christ, its program of exploration, discovery, and settlement was tailored for this dual purpose. His first adventure, in 1415, was the defeat of the Muslims at Ceuta (Morocco), which helped open the African coast to exploration. Henry experimented with ships and navigation during this venture, which led to designing of the caravel, a long and slender ship (by comparison) with lateen sails, that would be used by his Portuguese explorers on their long voyages. Also the navigational instruments, such as the astrolabe, quadrant, and cross-staff, were developed to fix a ship's position. His captains kept logbooks of their voyages to document their experience for the knowledge of others. They also used flat maps to record longitude and latitude thereby simplifying cartography methods. Navigation and seafaring during this period was dangerous, harsh and unforgiving; positions had to be known (in order to know one's way back), the winds, weather changes, currents changed drastically in different locations and small wooden ships could be broken at sea. Supplies of food and water could easily run out during these voyages, and disease could strike. Superstition and fear was also an important passenger on these voyages, and only a few crews were clear of the obstacles associated with sailing alone in the ocean sea. What is known is that the Portuguese Atlantic islands were not unknown; a growing body of documents had shown that the islands were known to sailors. But most important is the language used by Prince Henry's personal chronicler, who wrote that the Prince "ordered [them] to find the islands" (referring to the Portuguese navigators and captains), rather than just sending his fleets into the unknown to discover what they could. The exact date of this re-discovery of the Atlantic islands is not clear, though historical accounts indicate that the islands of Santa Maria and São Miguel were the first to be discovered by navigator Diogo de Silves around 1427.
finally, Azores may have been a Portuguese-variant of the Genovese or Florentine azzurre or azzorre, which translate to "blue" and may refer to those sailors' stories of the mythical "Ilhas Azuis". In fact, the blue-green vegetation on the islands of the Azores appear blue, even at a close distance. The Portuguese word for "blue" is similarly azul. It is clear that after 1420, regular expeditions captained by Gonçalo Velho Cabral, Diogo de Silves and other mariners began to the west and south of continental Portugal. On 15 August 1432, a small sailing vessel with a dozen crew members, disembarked on the island that would bear the name Santa Maria (owing to its supposed day of its "rediscovery", the Assumption Day of the Virgin Mary). With their beginnings in the eastern group of islands, the explorers advanced quickly into the rest of the archipelago, finally reaching the more westerly islands (Flores and Corvo) by about 1450 at a time when populations were already relatively large The first expeditions, apart from coastal observations and an occasional landing were limited, and in most cases involved the deliberate disembarking of herd animals (sheep, goats and/or cattle), pigs and chickens on the discovered islands, as a way of providing future settlers with some means of subsistence. There is also a reference to the purposeful settling of a group of slaves at the end of the 1430s, in the area of Povoação on the island of São Miguel. The "official" colonization of the archipelago began in Santa Maria, where the first settlement was constructed in the area of Báia dos Anjos (in the north of the island), and quickly moved to the southern coast (to the area that is now the modern town of Vila do Porto). Settlers quickly arrived from the provinces of Algarve and Alentejo as Gonçalo Velho's nephew and heir, João Soares de Albergaria, advertised and promoted settlement on the island. In the following centuries settlers from other European countries would arrive, most notably from Northern France and Flanders. By 1440, other settlements had developed along the river-valleys and coastal inlets of São Miguel, Terceira, Faial and Pico, supported by game animals and fishing. An abundance of potable water sources, along with fertile volcanic soils, made the islands attractive and easy to colonize, and the growing wheat market would support an export economy (along with various plant species that allowed the development of the dye industry in the colonies). Christopher Columbus made an unplanned stop on Santa Maria after his first voyage to America, prior to returning to Spain, when the Niña was forced there by a storm. During the storm, all hands had vowed, if they were spared, to make a pilgrimage to the nearest church of Our Lady wherever they first made land. Anchoring at Santa Maria, the travelers were told by people onshore that a small shrine dedicated to Our Lady was nearby. Columbus sent half of the crew members to the island to fulfill their vow, but he and the rest of the crew stayed on the Niña, planning to send the other half to the island upon the return of the first crew members. While the first crew members were saying their prayers at the shrine, they were taken prisoner by the islanders, under orders from the island's captain, João de Castanheira, ostensibly out of fear that the men were pirates. The boat that the crew members had taken to the island was then commandeered by Castanheira, which he took with several armed men to the Niña, in an attempt to arrest Columbus. During a verbal battle across the bows of both craft, during which Columbus did not grant permission for him to come aboard, Castanheira announced that he did not believe or care who Columbus said that he was, especially if he was indeed from Spain. Castanheira returned to the island. However, after another two days, Castanheira released the prisoners, having been unable to get confessions from them, and having been unable to capture his real target, Columbus. There are later claims that Columbus was also captured, but this is not backed up by Columbus's log book. The island of São Miguel was apparently populated by 1444. The population came mostly from the regions of Estremadura, Alentejo and Algarve. The colonists spread themselves along the coastline in areas where conditions of accessibility and farming were best. The fertility of the Azores contributed to its population expansion, as the islands were soon exporting wheat to the Portuguese garrison in North Africa and of sugar cane and dyes to Flanders. Later oranges were grown and exported to the British Isles. The area was also frequently subjected to pirate attacks. During these times Ponta Delgada became the capital. The first capital was Vila Franca do Campo, but when it was destroyed in 1522[clarification needed] Ponta Delgada assumed the position. It became the first city on the island in 1546. Terceira Island was the third island to be discovered, and its name literally means "Third Island". It was originally called the Island of Jesus Christ and was first settled in 1450. Graciosa Island was settled shortly afterward from settlers from Terceira. Flores Island was discovered in the late summer of 1452 by the navigator Diogo de Teive and his son João de Teive. The island's charter passed to Fernão Telles de Meneses, who only populated the island with sheep in 1475. His widow, Dona Maria Vilhena, contracted the Flemish Willem van der Haegen to settle Flores. After some negotiation, D. Maria would cede the rights to the exploration of the islands to Van der Haegen, in exchange for monthly payments. Around 1478, Willem van der Haegen settles in Ribeira da Cruz, where he built homes, developed agriculture (primarily wheat), collected more woad species for export, and explored for tin, silver or other minerals (under the assumption that the islands were part of the mythic Ilhas Cassterides, the islands of silver and tin). Owing to the island's isolation and difficulties in communication his crops became difficult to export and van der Haegen left Flores in the late 1480s. By 1504 the island's charter passed to João Fonseca and settlers streamed through the port of Armoeira to the small hamlets. The island became permanently populated during the reign of King Manuel I, in the year 1510, by people from various regions of continental Portugal, but mainly from the northern provinces. The island became arable, and grain and vegetables were cultivated. According to Santos et al. 's 2003 maternal DNA study of the Azores, people from Flores exhibit high genetic ancestry (~90%) with the Portuguese mainland, and Pacheco et al. 's 2006 paternal DNA study confirms that around 60% of all Azorean paternal lines are correlated to those common in mainland Portugal. The residents of Terceira, who mostly settled in Porto Judeu and Praia da Vitória and along the coastline, took a brave stand against King Philip II of Spain upon his ascension to the Portuguese throne in 1580. They, along with most of the rest of the Azores, believed that António, Prior of Crato was the rightful successor, and defeated the Spanish at the Battle of Salga in 1581. In 1583, Philip tried again at defeating the Azoreans. He sent his combined Iberian fleet to clear the French traders from the Azores, decisively hanging his prisoners-of-war from the yardarms and contributing to the "Black Legend". The Azores were the second-to-last part of the Portuguese empire to resist Philip's reign over Portugal (Macau being the last), Azores was returned to Portuguese control with the end of the Iberian Union, not by the military efforts, as these were already in Restoration War efforts in the mainland, but by the people attacking a well-fortified Castilian guarnition. The Azores served as a port of call for the Spanish galleons during their occupation. In December 1640 the Portuguese monarchy was restored and the islands again became a Portuguese possession. The 1820 civil war in Portugal had strong repercussions in the Azores. In 1829, in Vila da Praia, the liberals won over the absolutists, making Terceira the main headquarters of the new Portuguese regime and also where the Council of Regency (Conselho de Regência) of Mary II of Portugal was established. In the second half of the 19th century, Azores played an important role in the rebirth of Portuguese cod fisheries in Terra Nova (Newfoundland). In fact, it was Azorean emigrants from the East coast returned to their homeland that taught the American dory fishing technique to Portuguese that started to catch again cod in the Grand Bank after the middle of the 19th century. Beginning in 1868, Portugal issued its stamps overprinted with "AÇORES" for use in the islands. Between 1892 and 1906, it also issued separate stamps for the three administrative districts of the time. From 1836 to 1976, the archipelago was divided into three districts, quite equivalent (except in area) to those in the Portuguese mainland. The division was arbitrary, and didn’t follow the natural island groups, rather reflecting the location of each district capital on the three main cities (neither of each on the western group). During the Second World War, in 1943, the Portuguese dictator Salazar leased bases in the Azores to the British. This represented a change in policy. Previously the Portuguese government only allowed German U-boats and navy ships to refuel there. This was a key turning point in the Battle of the Atlantic, allowing the Allies to provide aerial coverage in the middle of the Atlantic (i.e. it closed the Mid-Atlantic Gap). This helped them to hunt U-boats and protect convoys. In 1944, American forces constructed a small and short-lived air base on the island of Santa Maria. In 1945, a new base was founded on the island of Terceira and is currently known as Lajes Field. It was founded in an area called Lajes, a broad, flat sea terrace that had been a farm. Lajes Field is a plateau rising out of the sea on the northeast corner of the island. This air force base is a joint American and Portuguese venture. Lajes Field has, and continues to support US and Portuguese military operations. During the Cold War, the US Navy P-3 Orion anti-submarine squadrons patrolled the North Atlantic for Soviet submarines and surface spy vessels. Since its inception, Lajes Field has been used for refuelling aircraft bound for Europe, and more recently, the Middle East. The US Army operates a small fleet of military ships in the harbor of Praia da Vitória, three kilometers southeast of Lajes Field. The airfield also has a small commercial terminal handling scheduled and chartered passenger flights from other islands in the archipelago, Europe, and North America. In 1976, following the Carnation Revolution of 1974, the Azores became an Autonomous Region within Portugal (Portuguese: Região Autónoma dos Açores), along with Madeira, when the a new regional constitution was implemented and the Azorean districts were suppressed. ^ Already both Plutarch (Life of Sertorius) and Pliny the Elder report that fishermen from Gades (Cadiz) routinely visited Atlantic islands to the southwest. ^ De Las Casas, Bartolomé; Pagden, Anthony (8 September 1999). A Short Account of the Destruction of the Indias. New York: Penguin Books. ISBN 0-14-044562-5. ^ Ashe, Thomas (1813). History of the Azores, or. Western islands. Oxford University. ^ Amat di S. Filippo (1892: p.534); Mees (1901: p.140). Marcel (1887: p.31) suggests it may have already been hinted at in the Angelino Dulcert (1339) map, under the names St. Brendan, Primaria sive puellarum, Capraria and Canaria. ^ Martin Behaim noted that two ships discovered the lands in 1431, and that a fleet of sixteen ships were sent to colonize the islands in 1432. ^ The islands of Flores and Corvo were discovered by Pedro Vasquez de la Frontera and Diogo de Teive in 1452, during their return from voyages to the west, usually attributed to other discoveries or from fishing in the Terra dos Bacalhaus (the name attributed to the eastern coast of Newfoundland in Canada. Fructuoso, G. (1966). Saudades da Terra (Vol. 1–6), 1873. Instituto Cultural de Ponta Delgada, Ponta Delgada. ISBN 972-9216-70-3. Diffie, B.W. ; Boyd C. Shafer; George Davison Winius (1977). Foundations of the Portuguese Empire, 1415–1580 – Europe and the World in the Age of Expansion (2nd Ed.). University of Minnesota. ISBN 0-8166-0782-6. Fernández-Armesto, F. (2007) Before Columbus: exploration and colonisation from the Mediterranean to the Atlantic 1229–1492. Philadelphia: University of Pennsylvania Press.